For the first time - ever - an exhibit has appeared at The Hyde Collection, focusing on a never-before-shown theme; the relationship between a painter and his love of melody - Degas and Music. While there have been many exhibitions worldwide that feature Edgar Degas, some of which were even organized by the current exhibition's curators, none have ever focused on the connection between the French artist and the music he enjoyed. Edgar Degas lived for 83 years prior to his death in 1917. As a child, he was surrounded by music and music-lovers - his father played piano and the organ in church, and his sisters both sang. 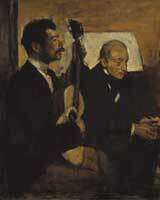 Degas himself attempted to become a musician, first learning to play the violin and later the piano, but without much success. Despite this, he retained his love of music, frequenting the Paris Opera House and befriending many of the orchestra members. He closely followed the new music of the time and personally knew many living composers. His strongest influences came from listening to (and occasionally watching) the music, choirs, and operas of Handel, Debussy, Bizet, Gluck, Mozart, Offenbach, Rossini and Verdi, among others. The exhibition was organized by The Hyde and curated by Jill DeVonyar and Richard Kendall, who have both collaborated twice before to present exhibitions on Degas's work. The combination of their skills and interests makes a perfect blend for an exhibition on Degas - DeVonyar trained and taught for many years as a classical dancer, and Kendall studying as a painter at the Central School of Art and Design in London. 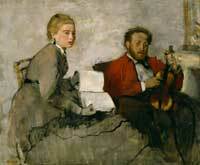 Both take a keen interest in Degas, with several essays, lectures, and books between them. DeVonyar was honored by receiving the Peabody award for her advising of the PBS film Degas and the Dance, and Kendall has been appointed an Officier des Arts et des Lettres by the French government. The exhibit features over 35 paintings, works on paper, and sculptures on loan from museums such as the Art Institute of Chicago, the Metropolitan Museum of Art, and the Musée D'Orsay. Also on display for the first time is a portfolio of prints that was discovered on a shelf of un-catalogued books on the third floor of Hyde House. Searches for the book began after letters between Charlotte Hyde, the founder of the museum, and her curator alluded to the acquisition of a Degas portfolio. 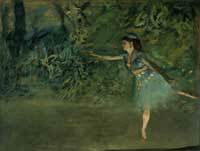 It includes prints and reproductions of Degas' work which were all authorized by the painter. Also included in the exhibition is an area for visitors to listen to the music that inspired Degas during his lifetime. In collaboration with Museum Music, the museum has also produced a CD of these compositions, which, along with the catalogue and many other items, is available in the museum store. 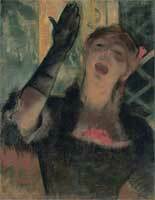 The Degas and Music thrill does not stop at the Hyde Collection. There will be over 70 Degas-Related events at arts institutions ranging from Blue Mountain Lake to Schenectady, aimed at all ages and interests. Events range from art studio classes, children's events, film and lecture series, concerts, tours of area studios, ballets, operas, lectures, and book groups. Over 40 venues and companies are participating in this "Season of Degas", across 5 counties. More than 35 sponsors have made this exhibition possible with their generosity.